Don't think I've had a better set of liners straight out of the box, heat moulded straight into my SL2's. The first new liners I've had that broke in without blisters. Only let down about them is the insoles, with a liner that packs memory foam into every square inch I'd expect something slightly better but can't win them all I guess. Size 8-9 liner in a Razor SL Quinny Size 9 shell. No stiffeners other then cuff wrap, laces removed. I waited months for these, but it was well worth it. At first they filled the shell too much and were very uncomfortable and caused a lot of pressure to the top of my foot. So much so I had to remove the laces. SL's have a low ceiling height. After 40 minutes of skating in 5* Celsius weather they got hot and started to form to my foot. By my 3rd 3 hour session they were dreamy!! They are really the nicest feeling liners I have ever had and I come from a past of entirely salomons. 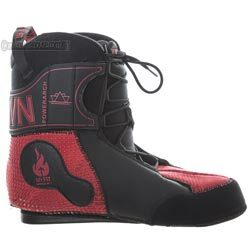 They feel similar to a high end snowboard once broken in and have made my skates extra responsive. Fingers crossed they hold up! !